In March 2014 Oliver Dörr (Osnabrück), Marc Frey (Munich), and Jörn Axel Kämmerer (Hamburg) organized the Hamburg Symposium on Colonialism and International Law at the Bucerius Law School. Some of papers of the conference have now been published as articles in the new issue of the Journal of the history of International Law. My own article deals with the topic of Human Rights for and against Empire – Legal and Public Discourses in the Age of Decolonisation (JHIL, Vol. 18, 2016, p. 317-338). Against the background of an ongoing debate about the role of human rights in the age of decolonization this essay approaches the issue from two different angles. 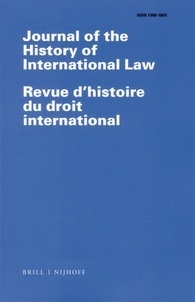 It concentrates on the paradoxical situation that anti-colonial movements as well as colonial powers instrumentalized international human rights documents such as the Genocide Convention, the Universal Declaration of Human Rights, the Geneva Conventions, and the European Conventions on Human Rights for achieving their political goals. In combining legal and public discourses in a significant way both sides accused each other of gross human rights violations while at the same time presenting themselves as respecting and even guaranteeing fundamental human rights. Especially during the course of the wars of decolonization after 1945 this phenomena became obvious in various diplomatic debates at the United Nations and made universal rights a diplomatic pawn in international debates. This entry was posted in Actualités / News, Articles and tagged Algerian War, Decolonization, Human Rights, International Humanitarian Law by Fabian Klose. Bookmark the permalink.